OK you better answer YES to this question! LOL! I’m not that old yet! Do you remember the movie Clash of the Titans? I so loved that movie when I was a kid. Harry Hamlin was the HOT Greek God Perseus. Oh did I love him. Here is a You Tube clip of when he met up with Medusa! There is a ton I found on Google. LOVE IT! I never knew they made Clash of the Titan’s figurines!! Well THAT is where my love of owl’s started! Remember the golden owl in the movie? Bubo was the name of a mechanical owl in the 1981 film Clash of the Titans. It was a gift of Zeus made by Hephaestus for Perseus since Athena would not cede her companion bird. The name is derived from the Bubo genus of owls. Bubo watched over Perseus. REMEMBER????? Now, when I saw this owl (below)from C.C. Designs A Hootin Good Time, it brought back fond memories of watching that movie a million times. AND my love for Bubo. I’m sure if I watched it now I would die of laughter. So I’ll keep the memory as is! I used some HOT colors, gaining inspiration from some Basic Grey paper. LOVE IT!!! I colored my bridal confetti flowers, with my copic markers, to look like the flowers in the paper, for a little something extra. Sentiment, and flourish are by Stampin Up! I thought the phrase-so thoughtful was cute for the owl! LOL! So after that super long explanation, I am leaving you with the sketch for today! I know a whole day early! Happy Mother’s Day! LOL! Here is yet another sample! Its the same layout! My focus became the panels, not the center circle image. This sample uses In the Meadow my Lizzie Anne. This is going to be Jason’s mom’s Mother’s Day card. It doubles for my blogger’s challenge too! 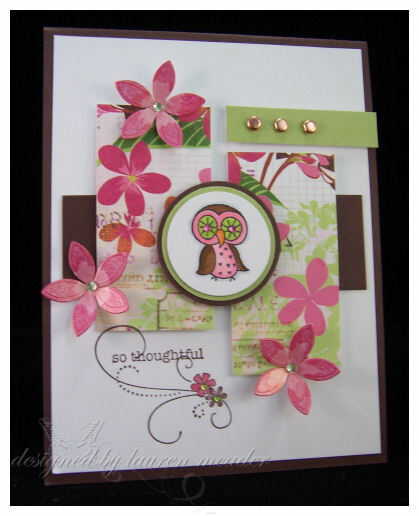 The blog challenge was to create a card for Mother’s Day! YAHOO!! Here is one of them. I wanted a VERY SOFT look for this, so I brushed my Pebble’s chalks onto my cardstock. They are shimmery, so while the color is subtle it makes a huge impact. I then took my quickie glue pen (yes you need one) and colored in parts of the flowers. I then added white flock, so they look just like the real deal!! You just want to make a wish, and make them blow away. Here is a closer view-because they are worth it! This is a sweet & funny card to me because Jay’s mom is a total nature person. If I ever got stranded somewhere, with anyone, I want it to be her! Me and my mom would cling to each other and just die! While, Jay’s mom knows all that naturey stuff, of what you can and can’t eat. If its poisonous to picking the dandelions out of her yard for salad! When the kids eat something weird she is the first person I call to identify what it was they ate so I can call poison control-I kid you not. Last year Alexa ate a Lily of the Valley berry-THAT is poisonous. Great right? ME-so NOT naturey! I love the beach, and any place that has “amenities”. No reptiles, rodents, or a large assortment of bugs that could freak me out, and possibly kill me. Places with a bed, and HOT shower. Anyway, we got her a grow your own salad kit, since she does this in her own back yard, she can bring it indoors. I hope she likes it, because I really did think a lot about her card. Every-time I see a dandelion I think of her. DID YOU KNOW-She is the one who introduced me to stamping! I loved all her hand-made cards she would make for me, that I decided to give it a whirl! I owe finding this passion to her, for sure. How can I possibly thank her for all that? OK so that is it. Today I am off the a field trip with the kids to the Space center. Amber has her dance recital this weekend. My mom is coming up for a visit, and things will be busy. I hope whatever you do, is enjoyable! I’m picking my mom up some of those YUMMY desserts from Jacques Pastries, like I got on my birthday! She was tickled pink, when she saw them here! I hope to get her a couple to go with her gift. If you try the sketch, send us a link here so we can all see it! 71 Responses for "Do you remember……(and sketch time)"
These are FABULOUS Lauren, I love the touch on the dandelions!!! And on my gosh that movie……I watched it a zillion times as a kid and yes, it is so dorky to watch it now! But it gives me a giggle that your owl love came from that movie! Two beautiful cards! I luv your card design for these, it’s so beautiful! You did make me laugh, I loved him too, what a fabby film! Both cards are beautiful! The owl one made me laugh because his eyes look like lime slices…don’t get me wrong…I love them and his funky colors! 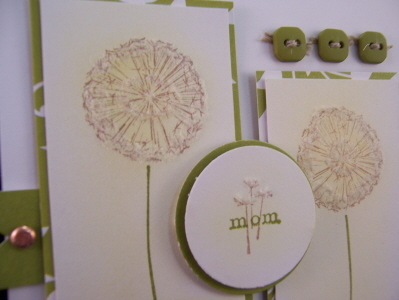 Your dandelion card is very soft and gentle and LOVE the flocking on it! We watched that movie a million times when we were kids. HOw funny! The updated Bubo is awesome. What a wonderful layout! Super cute contribution to the challenge this week! The movie (and Ursula’s boy toy, Harry) are probably top-rated “guilty pleasures” for LOTS of us – grins! LOVE the layout and cards you’ve made. 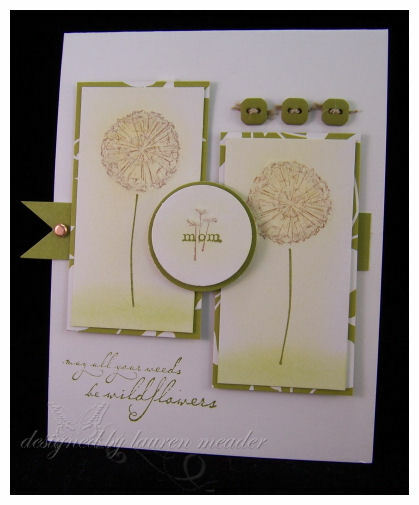 I’m hooked on owls and birds and wildflowers lately, and now think I need to go stamp some dandelions! Thanx for the regular source of inspiration! Oh Lauren, all of these are beautiful. You never cease to amaze me with your talent and eye for design. FABULOUS! Beautiful! I love your sketch and the soft colors in your Mother’s Day card. My mother is artistic, but I’ve never gotten her to stamp a card…she just loves the ones I make. I love Clash of the Titans! The cheesiest, corniest movie evah and I love it!!! Fabulous cards Lauren! Love how you coloured the owl in your first card….too cute! Your idea for the flowers in the second is perfect….you really do just want to blow and make a wish and watch it float away! So cool! Thanks for posting the sketch early. I should have time this afternoon to work on it! Both if these are adorable! TFS! Ha! I want to go home and watch that movie now! Seriously, it was one of my absolute favorites as a kid! Thanks for the memories 🙂 Love the Bubo card…you’re absolutely right! Looks just like him! And I love, love, love the dandelion card as will your MIL. The realism the flock lends is stunning! Great job as always 🙂 Have a wonderful mother’s day! I am so impressed that your MIL introduced you to stamping. What a good MIL. My MIL does not like me.(seriously!) So when I hear stories like this, it makes me happy for the person, sad for me. So…enjoy her. Love her. Thank her (for her son & for loving you). You are one lucky gal! On to the card……love it. They each have the same sketch, but look TOTALLY different. That is so neat. That is what I love about our craft~you can make every card your own. The wildflowers card is very pretty. These are fab! I love that sketch, I hope I find time to play. Oh very cute!! I love the flower one!! I totally forgot that Harry Hamlin was in Clash of the Titans! We watched that movie all the time!! Love the images – they work perfectly with your sketch. I don’t think I’ve ever seen the movie. I’ll have to rent it now for sure. Love your cards and the sketch! 🙂 You always do such nice work and it’s always a treat visiting your blog! Gotta run – big hugs to everyone! Great sketch! I love the way the second card turned out. Both cards are gorgeous. The Wildflower one is stunning. Great job on both fabulous cards. Oh I totally remember that movie! I can’t even tell you how many times my brothers and sisters and I watched that! LOL LOVE your card and the sketch! I hope to play! Beautiful cards and fun sketch – hope to be able to play with it early next week!! Happy Mother’s Day Lauren! fabulouso as always! I have a couple of dandelion stamps so this will be a perfect idea for them!!!!!! Thanks! Adorable Owl..such pretty papers and flowers!! *Enjoy your field trip..and Have a Great day!! OK – I use to watch that movie over and over and over again!! I loved. Try watching it now though and it’s not the same. I miss my version of life when I was a kid! haha! Great cards Lauren! Great cards, cute owl, and I love that sketch! Laurne, I just love how you came up with such different cards using the same layout! The simple way you reversed the focal points is just genius. So I am sure you already know this but I saw at Michaels those wedding flowers in pink, blue and black and white together. Cute cards as well!!! Stunning! – What an interesting and eye catching sketch. You did a great job with both cards. I have to say that the Dandelion card though really caught my eye. I so remember watching that movie….couldn’t stand those scorpians though or Medusa. Yuck! EARLY Sketch!! You are DA BOMB!!! LOVE that owl card…’specially his psychadelic eyes!!! I hope to do this tonight or tomorrow!! Oh I remember Clash of the Titans!! It was one of my favourites. Actually it was on TV about a month ago. It was great to see it again after so long. The special effects were really good considering when it was made. Oh my goodness, that flock is an amazing detail! What a jaw dropper! Oh yes…I remember that movie, and loved it! Your owl card is so perfect too!! (Thanks for the reminder! Your In the Meadow Mom card is stunning, Lauren!! Fantastic sketch too!! Lauren, I just get exhausted listening to you!! It is amazing what you can do with just one day! Your card is so beautiful as well as the thought that went into it. Just wanted to wish you a very Happy, Happy Mother’s Day and hope you get a lot of pampering. Both cards are BEAUTIFUL!! I love the sketch and what you did with each one. I didn’t see Clash of the Titans…those were my days of working full time, dancing, and raising three children, plus I don’t care for that genre of film. I like movies with beautiful clothes, houses, furniture, and gardens, I think I’m a Stepford Wife, teehee. I also love mysteries and love stories, when the love stories end right. It’s so wonderful to have a MIL you admire, that’s a blessing. Have FUN with your mom and HAPPY MOTHER’S DAY to both of you. Here’s my attempt at this sketch http://stampnscrapjenn.blogspot.com/2008/05/weekend-sketch-part-2.html. It was a little bit more complicated than I thought it was going to be. Your cards are beautiful! Thanks for all of your inspiration! Happy Mother’s Day! Here’s my sketch Lauren: http://www.splitcoaststampers.com/gallery/photo/910252?cat=500&ppuser=2910 I altered it a bit though. Moved the saying into the circle. Totally Love the cards that you did with this sketch, I can’t say I watched that movie, but I love the card inspired by it. The second one is so soft and lovely, I so like the buttons too! My brother and I watched that movie a million times! And the golden owl was wonderful! I bet if I saw it I would be amazed at how cheesy it probaly seems now but at the time it was great fun! OH. MY. GOSH!!! I LOVED THAT MOVIE!!! IT was the best EVAH!!!!!!!!!! I used to think it was so amazing. Wasn’t Perseus DREAMY!! LOL! Awesome cards! Thank for another great sketch ,Lauren. I had fun doing this sketch. Here’s what I came up with..
Lauren, everything you touch ROCKS! You are seriously the Queen. 😀 Love that little owl! Hey Lauren! I’m back and finally got my card photographed and uploaded to my blog…thanks for looking! Well, I don’t like the card all that much but I did try the sketch. Tell me…what do you honestly think? Blah? Well, not really blah as in boring but definitely blah as in ick…I think. Vacheron Constantin’s charity auction for the specially designed this special watch “Only Watch”, visible Vacheron Constantin outstanding contribution to charity, although the style is simple, but inside it contains multiple meanings, leaving the imagination of many people space.